No one wants to open the refrigerator door to a horrendous blast of smelly odors. The typical box of baking soda to absorb these nasty fridge aromas isn't something we want to look at either. The solution is this cool new Chill Bill Penguin. 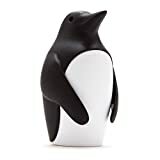 This whimsical penguin sits in your fridge or freezer (penguins probably prefer the freezer) and effectively absorbs in all the unwanted odors. Just fill him up with simple baking soda, place in the door or on a shelf to start him working, and when any smells return, just replace the baking soda with fresh. Also doubles as a conversation starter when anyone asks why there's a cute little penguin in your fridge.